A writer of steampunk novels, I am naturally drawn to writing spaces that evoke the feeling of the 19th century. 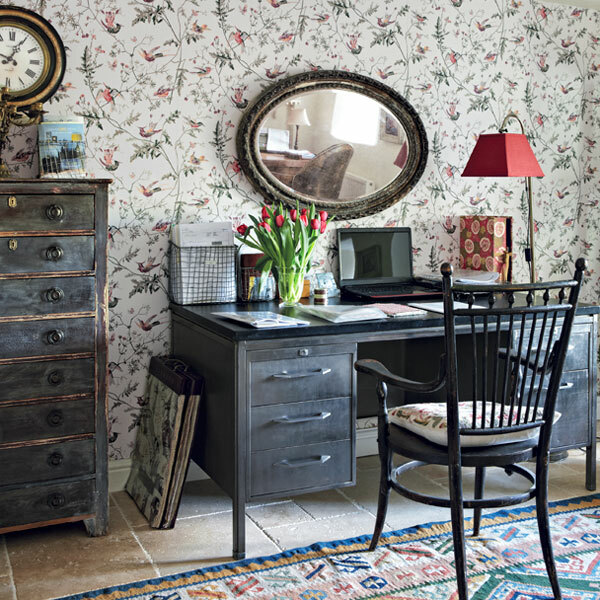 Here, this English cottage styled office picks up that century’s stamp with the nature-inspired wallpaper, the antique clock, spindle-back chair, and distressed pine chest are juxtaposed with a mid-century brushed-steel desk. The greys, ecru and red highlights make the room shine and the weathered finishes pull the look together and are what makes this writing space work. Love those dark colors on the furniture. I could very easily disappear into something like this. Especially if it’s built on a house on a hill or some such.